Figure 8: Velociraptor had very acute hearing which was necessary for successful hunting. Hearing is important in predatory animals such as Velociraptor. The middle-ear cavity was greatly enlarged, suggesting that these theropods were able to hear low frequency sounds. As a group, Dinosauria were equipped with good to excellent hearing machinery. All dinosaurs had the skull notches to hold a taut eardrum. 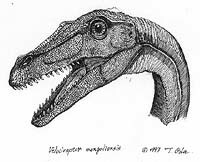 All dinosaurs also had middle-ear bones which were thin and delicate, like a bird's, for picking up higher frequencies. In the fluid-filled canals of the brain, the dinosaur's ear was rather like a crocodile's. Since crocodiles today have the most sensitive hearing of any reptiles, the dinosaurs were certainly tuned into a wide range of airborne sound.